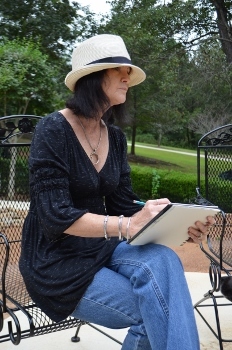 Linda Dragonette, an award-winning artist, whose works have been displayed internationally and on movie sets, was selected by The McDonald’s Division as the 2014 Art Partners program artist. 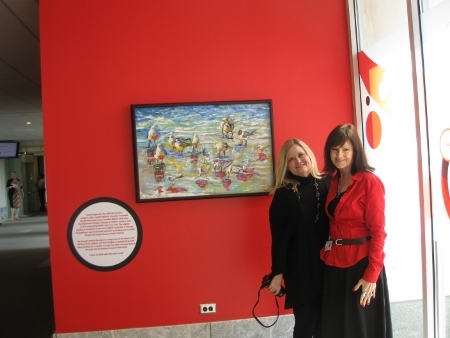 Linda incorporated Ronald McDonald House Charities (RMHC) and Coca-Cola in her original painting, ‘Birds of a Feather,’ which will be auctioned at the annual RMHC fundraiser in Chicago. The painting will be reproduced into prints for fundraising use by all the Ronald McDonald Houses in North America, and featured in the ‘Expect. Employ. Empower.’ artwork display in the NAT corridor of the Coca-Cola building. I am so happy and overwhelmed to be chosen for this honor. In this painting I was to incorporate the Coca-Cola logo and the Ronald McDonald House logo (which is a heart). This is a partnership showing the wonderful support of the Coca-Cola Company for Ronald McDonald House. This is not an easy thing to do when painting a beach scene. So I chose the birds that I love so much to help in this painting. The larger beach birds in the background remind me of the parents , always near their children. 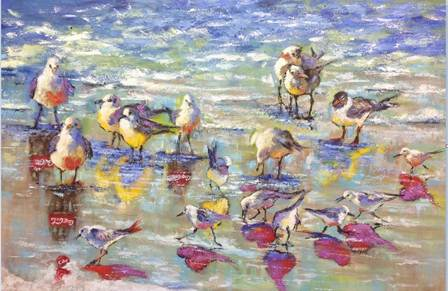 The little sandpipers in the foreground are running every which way, as children do at the beach. I chose the hearts (RMH logo) as the shadows for the little birds. And of course the reflection of the bigger birds being the Coca-Cola bottle. The families that are staying at the Ronald McDonald Houses are there because they have a sick child. The house gives them a refuge, a chance to be in a home setting and make their situation easier. What a truly wonderful charity this is. So my idea was to uplift their spirits by taking them away to a happier time in the past or a happy time in their future when their whole family can be carefree again. I just hope they might smile for a moment and know of how many people are praying for them. Thank You Ronald McDonald House Division and the Coca-Cola Company. This is my Wonderful Friend, Meri Cotney from Coca-Cola and me.